RESTful APIs have become increasingly popular both among web services and developers and are easy to serve up with the same software used for regular web pages. 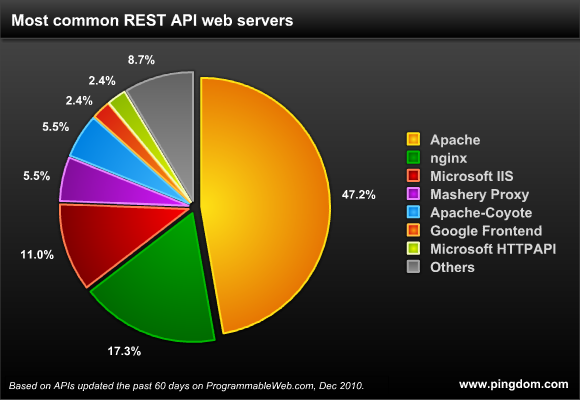 In May of 2010, 74% of web APIs used REST as their protocol. When setting up servers for a REST API it can make sense to use a web server software that is a bit more lightweight than what you’d use for a full-blown website. The gains are, at least in theory, that each API server that way could handle more requests since it would be less taxing on system resources. But is that what actually happens, or do most web services just put up an Apache server, same as they would do for a regular website? Since we’re working on a new REST API ourselves here at Pingdom, we were curious about this and decided to find out. Before we show you which web servers are most common for serving REST APIs, let’s first recap which web servers are the most common for serving regular web pages. 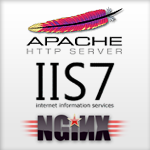 Apache and IIS need no introduction, and in case you haven’t heard of nginx, it’s a lightweight, high-performance web server that has been gaining in popularity the last couple of years. We wrote about its rise to fame earlier this year. Now let’s examine which web servers are most common for serving REST APIs. A good resource for finding web API listings is Programmable Web, which is what we used in this article. We filtered out the REST APIs that had been updated during the past 60 days, removed duplicates for APIs from the same provider, and ended up with a list of 127 APIs. It included a mixed bag of APIs both from big players like Google and Paypal, as well as plenty of smaller services. The relatively modest sample base we used means that these numbers won’t be super exact, but they are good enough for our purpose, which is to estimate which web servers are currently the most common for REST APIs. Apache is almost as common for serving REST APIs as regular web pages. This was perhaps not too surprising considering that it is highly mature software and above all is a well-known entity among webmasters. It might actually be more common than what is shown here, as we’ll explain here below in the bullet point about nginx. Nginx is significantly more common here than it is for serving regular web pages, although it’s still far behind Apache. It’s a huge jump for the little web server. However, since nginx is sometimes used as a load balancer (in front of example Apache servers) it’s difficult to tell how many of these APIs use it as an actual replacement for Apache. That said, nginx does have several properties that should make it suitable for serving up a web API, such as a very light system load and the ability to handle a huge amount of simultaneous connections. Microsoft IIS is in a relatively distant third place when it comes to serving REST APIs. These three web servers together make up more than three quarters of the web server software used. And a small side note regarding the “Others” category in the first chart. We lumped together all of those we only found one of: GSE, Cherokee, Jetty, Lighttpd, Node, Virtuoso, YAZ, Mongrel, Resin, PasteWSGIServer and mafe (this last one from Google Maps…). We haven’t decided yet what we’ll end up using for our new API. If you have built, or are building, a REST API, we’d love to hear your opinion. What web server are you using, or plan on using? What do you think is the best tool for the job? 60 days is not long enough. It’s perfectly natural for an API to be stable for longer than 60 days and still be relevant. @Justin: The point wasn’t to test ALL of today’s APIs. Just a sample. Apache isn’t a rest server, it is a web server. The “server” portion is better defined by projects like Jersey, restlet, spring WS etc. Surprised that lighttpd isn’t on the list. It might not be doing as well as nginx but I still think it deserves to be up there. lighttpd was one of the first open source “lightweight” web servers.